All donations support Heritage Village. 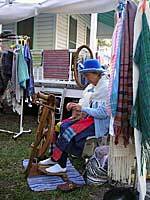 Join the spinners of Pinellas Weavers Guild to celebrate Roc Day as part of your New Year’s celebrations. The annual event is held at the McMullen House (also known as the Fiber Arts House). Guild members demonstrate fiber crafts including weaving and spinning, answer questions about fiber crafts, and share stories. Youth groups and summer camps travel back in time to enjoy interactive stations and learn about Pinellas County history! This is a docent-led activity. Pre-registration and adult chaperones required. Please call (727) 582-2472 to reserve your spot. Shop for fantastic gifts and seasonal decorations at the Country Jubilee! The event features a large flea market and book sale, handmade seasonal crafts, paintings, jewelry, stained glass, wooden treasures, musical entertainment, tours of select historic structures, and demonstrations of traditional crafts. This free event educates citizens about agriculture and enhances links between rural and urban dwellers. Activities include children's stations, making butter and ice cream, milking goats, feeding calves, and petting 4H animals. Visitors also learn how to plant and care for gardens. Enjoy holiday decorations, garland, and greenery throughout Heritage Village.